I generally don’t chortle with joy when I read the Washington Post. This is the newspaper, after all, that often slants the news in ways that irk me. Deceptive reporting about the budget. Though maybe, in one or two instances, I should accuse the paper of sloppiness rather than dishonesty. Regardless, I still shake my head with disdain. But not today. A recent story about corporate taxation brought a big smile to my face. Here are some passages that warmed my heart. 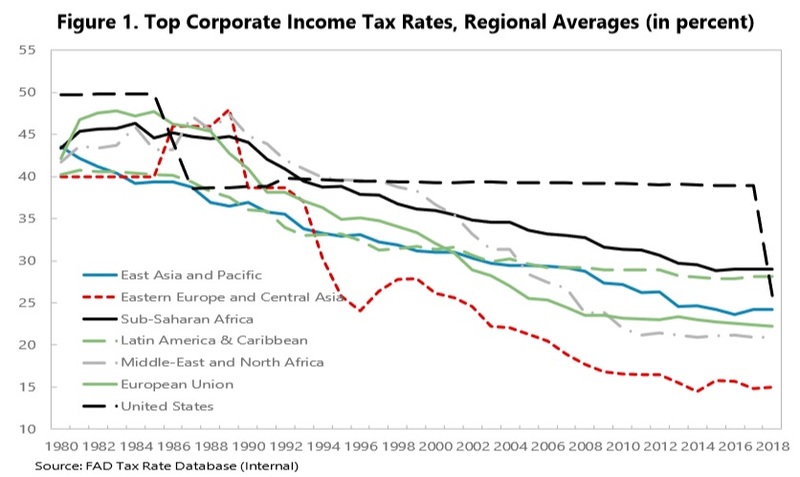 Taxes on corporations are plummeting across the globe… The average corporate tax rate globally has fallen by more than half over the past three decades, from 49 percent in 1985 to 24 percent in 2018, the study found. …The international decline in corporate taxes threatens to drain governments of a source of funding for health care and other social welfare programs. Republicans in Congress slashed the U.S. federal corporate tax rate from 35 percent to 21 percent. …the United States was joining a crowded party. In Japan and China, corporate tax rates have fallen by about a quarter since 2003. Rates are down about 30 percent over the same period across all of Europe, by 36 percent in Israel and by 27 percent in Canada. …Hungary…has lowered its corporate tax rate from 18 percent to 9 percent. But I’m not happy simply because corporate tax rates are being reduced. And I’m not smiling just because tax competition is pressuring politicians to do the right thing (though that does send a tingle up my leg). I’m also overcome with schadenfreude because advocates of bad policy are chagrined by these developments. “Corporate taxes are going to die in 10 to 20 years at this rate,” Ludvig Wier, an economist at the University of Copenhagen and a co-author of the study, said in an interview. “Without drastic collective action, you can see we’re nearing the end of it.” …academics say the falling tax rates…reflect a race to the bottom… The falling corporate tax rate represents a “collective action problem,” Wier argued, as each country has a strong incentive to lower its own tax rate, although when that is done the globe suffers. I guess we know Mr. Wier’s perspective. There’s a “collective action problem” and “the globe suffers” because corporate tax rates are falling. Perhaps he hasn’t read the substantial academic literature showing that lower rates are good for growth? Fortunately, some academics are focused on measuring the real-world impact of policy changes. Professor Juan Carlos Suárez Serrato of Duke University crunched some numbers for the National Bureau of Economic Research and found that jobs and investment both decline when companies can’t protect their income from government. …eliminating firms’ access to tax havens has unintended consequences for economic growth. We analyze a policy change that limited profit shifting for US multinationals, and show that the reform raised the effective cost of investing in the US. Exposed firms respond by reducing global investment and shifting investment abroad – which lowered their domestic investment by 38% – and by reducing domestic employment by 1.0 million jobs. We then show that the costs of eliminating tax havens are persistent and geographically concentrated, as more exposed local labor markets experience declines in employment and income growth for over 15 years. The moral of the story is that workers and investors benefit when money stays in the private sector. This means pushing corporate tax rates as low as possible, while also allowing companies to utilize low-tax jurisdictions for their cross-border transactions. That’s a win-win for the economy, and the angst on the left is a fringe benefit. I’ll close with this chart I put together showing how the average corporate rate has decline in developed nations. P.S. Individual rates also have declined since 1980, thanks if large part by the virtuous cycle of tax competition unleashed by Reagan and Thatcher. Sadly, the left has been somewhat successful in curtailing tax havens, and this has given politicians leeway to push tax rates higher in recent years. 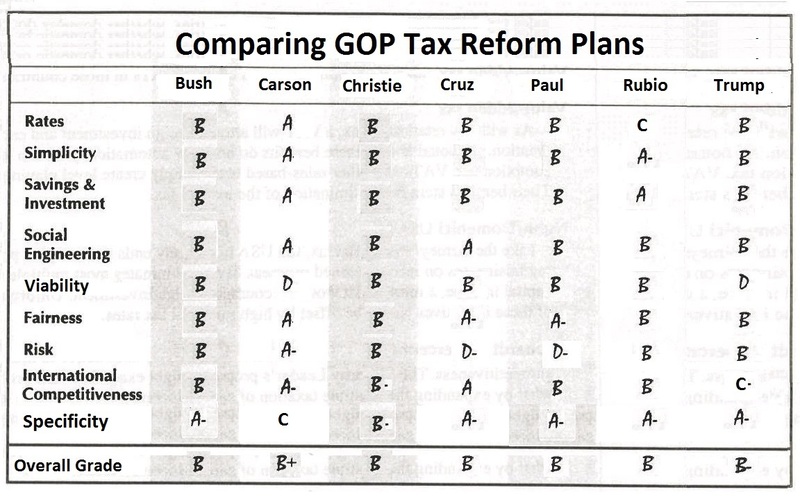 In early November, I reviewed the House’s tax plan and the Senate’s tax plan. I was grading on a curve. I wasn’t expecting or hoping for something really bold like a flat tax. Instead, I simply put forward a wish list of a few incremental reforms that would make an awful tax system somewhat less punitive. A few things to make April 15 more bearable. Some changes that would give the economy a chance to grow faster and create more jobs so that living standards could improve. Is that asking too much? It wasn’t even a long list. Just two primary goals. A lower corporate tax rate. Ending the deduction for state and local taxes. Eliminate special tax preferences for green-energy. Based on those items, I think House and Senate GOPers did a reasonably good job (at least compared to my low expectations earlier in the year). Now let’s look at the agreement in principle (AiP) that was just announced by House and Senate negotiators and assign grades to the key provisions. And we’ll start by looking at the items on my wish list. Is there a big reduction in the corporate tax rate? Is the deduction for state and local taxes abolished? Is the death tax repealed? Are special tax preferences for green energy wiped out? A grade for everything else? Here’s a partial list of the other provisions. There is a modest reduction in personal tax rates, including a reduction in the top rate on households from 39.6 percent to 37 percent. It’s always good to lower marginal tax rates, especially for high earners. The tax rate on pass-through businesses (i.e., smaller businesses that file personal tax returns rather than corporate returns) is indirectly reduced. This is good news, though it may lead to more complexity. The tax preference for housing is curtailed by allowing the write-off of interest only on mortgages up to $750,000. This is an improvement over current law, especially when combined with the higher standard deduction. The corporate alternative minimum tax is abolished. This is good news. The Obamacare individual mandate is repealed. This is good news, though it doesn’t solve the underlying problems with that law. The individual alternative minimum tax is curtailed. Repeal would have been better, but this is an improvement over current law. I’ll close with a caveat. An AiP is not the same as final legislative language. It’s not the same as votes for final passage in the House. Or the Senate. And it’s not the same as a presidential signature on a bill. When Ronald Reagan slashed tax rates in America in the 1980s, the obvious direct effect was more prosperity in America. But the under-appreciated indirect effect of Reaganomics was that it helped generate more prosperity elsewhere in the world. Not because Americans had higher income and could buy more products from home and abroad (though that is a nice fringe benefit), but rather because the Reagan tax cuts triggered a virtuous cycle of tax competition. Politicians in other countries had to lower their tax rates because of concerns that jobs and investment were migrating to America (Margaret Thatcher also deserves some credit since she also dramatically reduced tax rates and put even more competitive pressure on other nations to do the same thing). 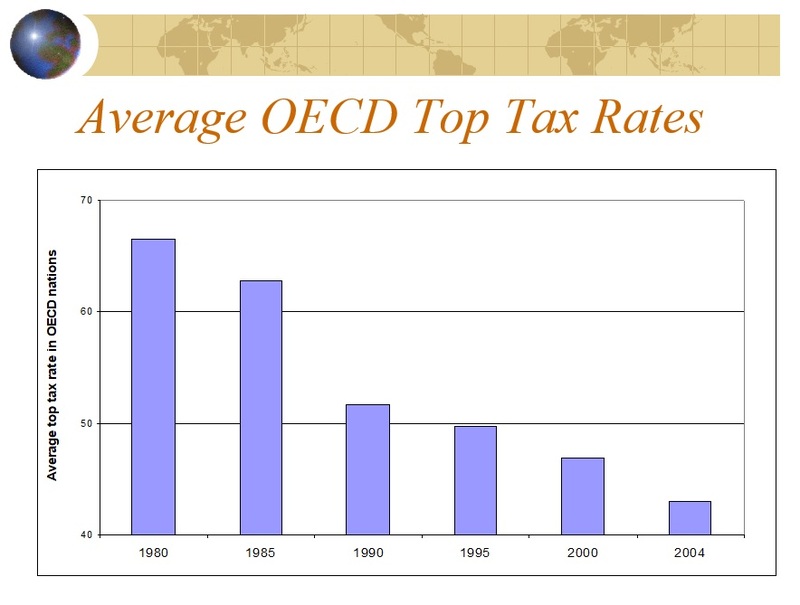 If you look at the data for developed nations, the average top income tax rate in 1980 was more than 67 percent. It’s now closer to 40 percent. And because even countries like Germany and France enacted supply-side reforms, the global economy enjoyed a 25-year renaissance of growth and prosperity. Unfortunately, there’s been some slippage in the wrong direction in recent years, probably caused in part be the erosion of tax competition (politicians are more likely to grab additional money if they think targeted victims don’t have escape options). But we may be poised for a new virtuous cycle of tax competition, at least with regards to business taxation. A big drop in the U.S. corporate tax rate will pressure other nations to lower their taxes as well. And if new developments from China and Europe are accurate, I’ve been underestimating the potential positive impact. Let’s start with news from China, where some officials are acting as if dropping the U.S. corporate tax rate to 20 percent is akin to economic warfare. U.S. tax cuts—the biggest passed since those during the presidency of Ronald Reagan three decades ago—have Beijing in a bind. 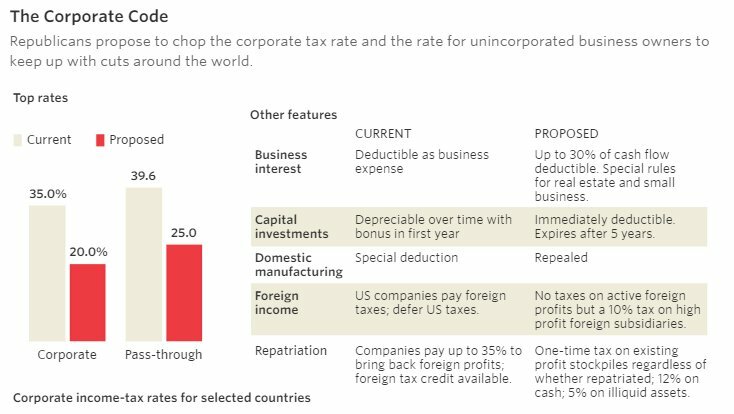 Prominent in the new tax policy are generous reductions in the corporate tax and a rationalization of the global tax scheme. Both are expected to draw capital and skilled labor back to the United States. …In April, Chinese state-controlled media slammed the tax cuts, accusing the U.S. leadership of risking a “tax war”… On April 27, state-run newspaper People’s Daily quoted a Chinese financial official as saying, “We’ve made our stance clear: We oppose tax competition.” …Beijing has good reason to be afraid. …“Due to the tax cut, the capital—mostly from the manufacturing industry—will flow back to the U.S.,” Chen said. While Chinese officials are worried about tax competition, they have a very effective response. They can cut tax rates as well. …the Communist Party had promised to implement financial policy that would be more beneficial for the general public, but has not put this into practice. Instead, Beijing has kept and expanded a regime whereby heavy taxes do not benefit the people…, but are used to prop up inefficient state-owned enterprises… Chinese officials and scholars are considering the necessity of implementing their own tax reforms to keep up with the Trump administration. …Zhu Guangyao, a deputy minister of finance, said in a meeting that it was “indeed impossible” to “ignore the international effects” of the American tax cut, and that “proactive measures” needed to be taken to adjust accordingly. …a Chinese state-run overseas publication called “Xiakedao” came out with a report saying that while Trump’s tax cuts put pressure on China, the pressure “can all the same be transformed into an opportunity for reform.” It remains to be seen whether communist authorities are willing to accept a hit to their tax revenue to balance the economy and let capital flow into the hands of the private sector. The Wall Street Journal also has a story on how China’s government might react to U.S. tax reform. …economic mandarins in Beijing are focusing on a potentially… immediate threat from Washington— Donald Trump’s tax overhaul. In the Beijing leadership compound of Zhongnanhai, officials are putting in place a contingency plan to combat consequences for China of U.S. tax changes… What they fear is…sapping money out of China by making the U.S. a more attractive place to invest. Pardon me for digressing, but isn’t it remarkable that nominally communist officials in China clearly understand that lower tax rates will boost investment while some left-leaning fiscal “experts” in America still want us to believe that lower tax won’t help growth. But let’s get back to the main point. An official involved in Beijing’s deliberations called Washington’s tax plan a “gray rhino,” an obvious danger in China’s economy that shouldn’t be ignored. …While the tax overhaul isn’t directly aimed at Beijing, …China will be squeezed. Under the tax plan now going through the U.S. legislative process, America’s corporate levy could drop to about 20% from 35%. Over the next few years, economists say, that could spur manufacturers—whether American or Chinese—to opt to set up plants in the U.S. rather than China. It’s an open question, though, whether China will respond with bad policy or good policy. Imposing capital controls to limit the flow of money to the United States would be an unfortunate reaction. Using American reform as an impetus for Chinese reform, by contrast, would be serendipitous. The sweeping overhaul of the U.S. tax code, estimated to result in $1.4 trillion in U.S. cuts over a decade, is also serving as a wake-up call for Beijing, which for years has dragged its feet on revamping China’s own rigid tax system. Chinese businesses have long complained about high taxes, and the government has pledged to reduce the levies on them. …Chinese companies face a welter of other taxes and fees their U.S. counterparts don’t, including a 17% value-added tax. …Chinese employers pay far-higher payroll taxes. Welfare and social insurance taxes cost between 40% and 100% of a paycheck in China. World Bank figures for 2016 show that total tax burden on Chinese businesses are among the highest of major economies: 68% of profits, compared with 44% in the U.S. and 40.6% on average world-wide. The figures include national and local income taxes, value-added or sales taxes and any mandatory employer contributions for welfare and social security. I very much hope Chinese officials respond to American tax cuts with their own supply-side reforms. I’ve applauded the Chinese government in the past for partial economic liberalization. Those policies have dramatically reduced poverty and been very beneficial for the country. Lower tax rates could be the next step to boost living standards in China. By the way, the Chinese aren’t the only ones paying attention to fiscal developments in the United States. The GOP tax plan also is causing headaches in Europe, as reported by CNN. Germany, France, Britain, Spain and Italy have written to Treasury Sec. Steven Mnuchin… The letter argues that proposed changes to the U.S. tax code could give American companies an advantage over foreign rivals. …They said the provision could also tax the profits of foreign businesses that do not have a permanent base in the U.S. …The finance ministers said they opposed another measure in the Senate bill that could benefit American companies. I have two responses. First, I actually agree with some of the complaints in the letter about selected provisions in the tax bill (see, for instance, Veronique de Rugy’s analysis in National Review about the danger of the BAT-like excise tax). We should be welcoming investment from foreign companies, not treating them like potential cash cows for Uncle Sam. So I’ll give them the same advice I offered to China. Respond to Americans tax cuts by doing the right thing for your citizens. Boost growth and wages with lower tax rates. As part of yesterday’s column about the comparatively tiny – and temporary – tax cut in the Republican tax reform plan, I quoted a leftist columnist for US News & World Report, who argued that there should be a big tax increase (including a big tax hike on middle-income taxpayers) and that such a tax hike would not hurt the economy. Today, I want to address the latter argument about taxes and economic growth. When this topic arises, I normally cite both public-finance theory and empirical research to make the case that taxes do impact economic performance, and I try to always stress that not all taxes are created equal. And if the focus is corporate taxation, I usually share my primer on the issue, and then link to research from Australia, Canada, Germany, and the United Kingdom. But maybe it will be more persuasive to look at some new academic evidence from a study on U.S. corporate taxes by Professor Eric Ohrn (forthcoming in the American Economic Journal). If you don’t want to dwell on the details, the paper’s abstract tells you the highlights. Simply stated, a lower corporate rate translates into more investment and less debt. I exploit quasi-experimental variation created by the Domestic Production Activities Deduction, a corporate tax expenditure created in 2005. A one percentage point reduction in tax rates increases investment by 4.7 percent of installed capital, increases payouts by 0.3 percent of sales, and decreases debt by 5.3 percent of total assets. These estimates suggest that lower corporate tax rates and faster accelerated depreciation each stimulate a similar increase in investment, per dollar in lost revenue. But hopefully there will be interest in some of the details from the study. 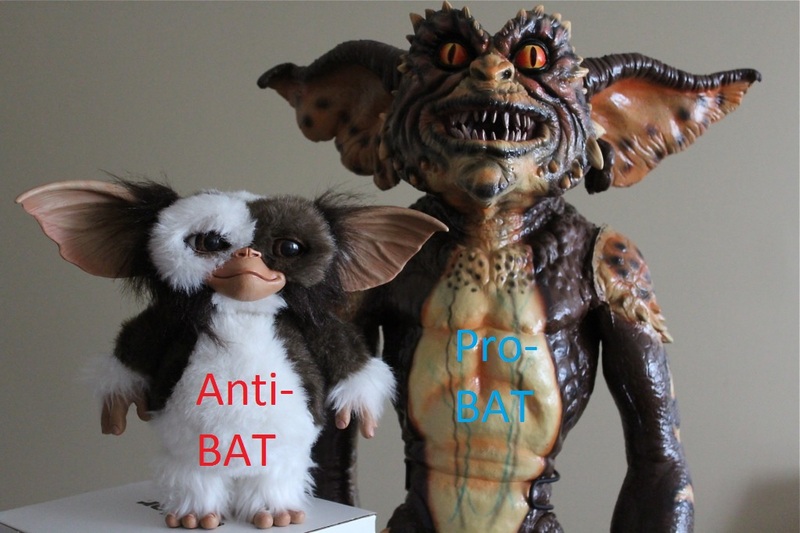 Here’s the problem Professor Ohrn identified. …relatively little empirical work has been able to directly estimate the effects of a reduction in the corporate income tax rate on business activity. This study provides new evidence on these effects. His evidence is based on the fact lawmakers created a lower tax rate for America-based manufacturing (a.k.a., the domestic production activities deduction, or DPAD). In 2005, when the DPAD was implemented, firms could deduct 3 percent of manufacturing income. This rate was scaled to 6 percent in 2007 and 9 percent in 2010, where it remains today. As a result of the policy, after 2010, firms that derive all of their income from domestic manufacturing activities and face the top statutory corporate income tax rate have a 3.15 (= 0.09 × 35 percent) percentage point lower effective tax rate than firms with no domestic manufacturing activities. 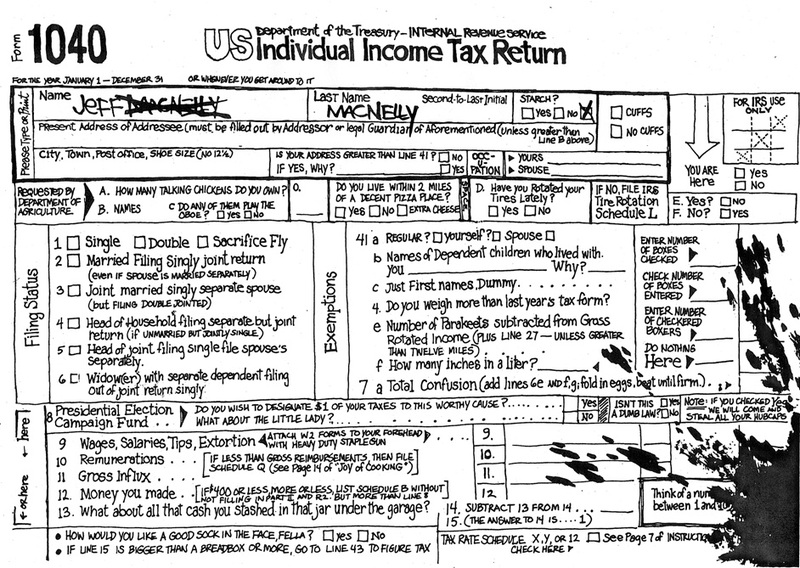 …I use data provided by the IRS Statistics of Income (SOI) Division. The SOI publishes the aggregate annual dollar values of the DPAD and Net Taxable Income for corporations in 75 unique industries and all businesses in 12 asset-classes (firm size bins). And what did he find as he looked at the difference between firms with lower tax rates and higher tax rates? It turns out that even modest differences in tax rates can have a big impact. I find that the DPAD has a large effect on corporate behavior. A one percentage point reduction in the effective corporate income tax rate via the DPAD increases investment by 4.7 percent of installed capital, increases payouts by 0.3 percent of revenues, and decreases debt usage by 5.3 percent of total assets. 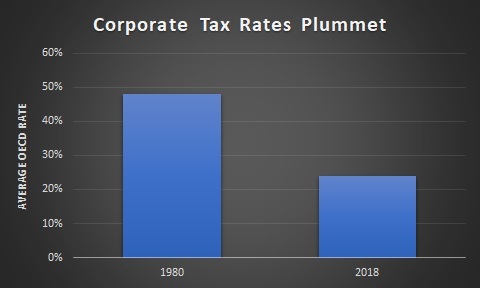 …corporations respond strongly to the DPAD, and corporate income tax rate cuts more generally, by increasing investment and payouts and decreasing debt usage. The average firm does not report more taxable income per dollar of asset, suggesting that any increases in revenue generated by corporate tax rate reductions are the product of real effects such as investment but not decreased avoidance activity. Here are a couple of charts from the study. The dark blue line represents companies with lower tax rates and the dashed line represents the ones with higher tax rates. And since it’s good to have more investment and good to have less debt, both these findings re very positive. Interestingly, the benefits of fixing depreciation laws (by moving in the direction of expensing) are quite similar to the benefits of lowering the corporate tax rates. …a dollar spent by the government stimulates virtually the same amount of investment whether it is used to reduce corporate tax rates or accelerate depreciation expenses. I hate to digress, but I can’t resist pointing out that I’m irked by the language about “a dollar spent by the government.” Professor Ohrn certainly seems to be a rigorous and capable economist, but he has a bit of a moral blind spot. If the federal government adopts a policy that allows a business to keep more of the money it earns, that is not “a dollar spent” by government. 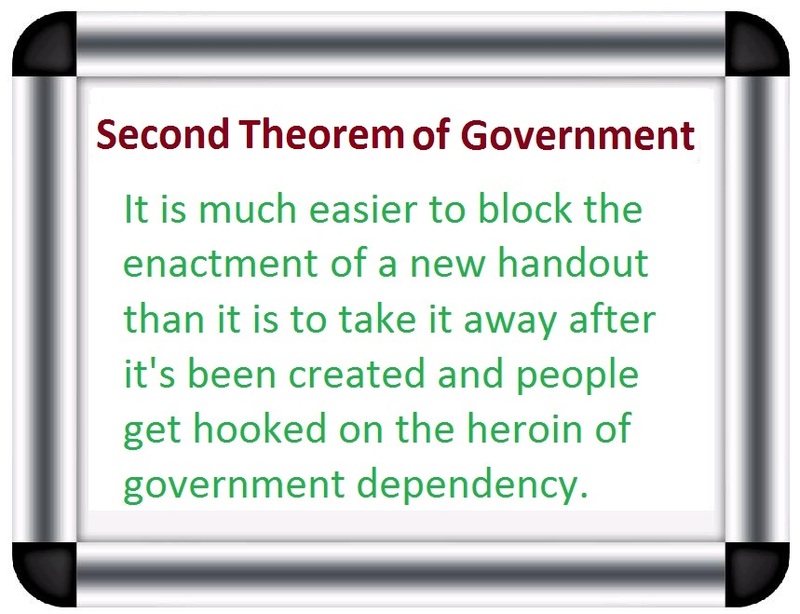 Unless you have the bizarre mindset of some statists who think all output belongs to the state. Anyhow, back to regularly scheduled programming. We’re now at a critical point in the battle for tax reform. The House passed its version and now the Senate has passed its version. The good news is that there’s strong agreement on Capitol Hill to slash the corporate tax rate. 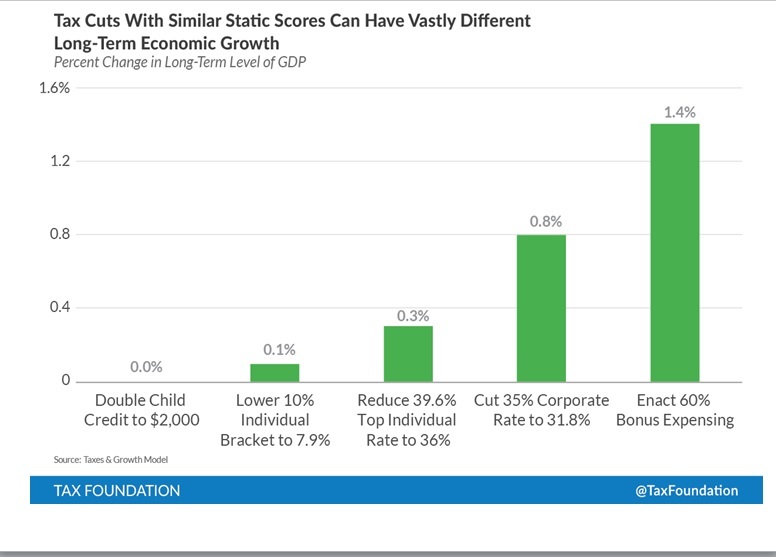 This latest study underscores why that reform will boost investment. And remember, when investment increases, that translates into higher wages for workers. House Republicans have unveiled their much-anticipated tax plan. Is this something to celebrate? Well, that depends on whether you’re grading on a curve. Compared to a pure, simple, and fair flat tax, it’s timid and disappointing. 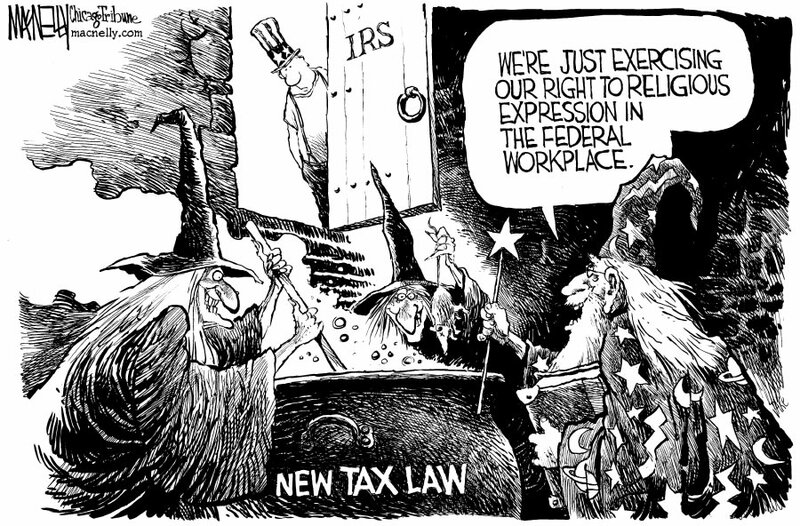 But compared to today’s wretched and unfair tax code, there are some very positive changes. At the end of 2015, I reviewed the major tax plans put forth by the various presidential candidates, grading them on issues such as tax rates, double taxation, and simplicity. Trump’s plan got the lowest score, though “B-” nonetheless represented a non-trivial improvement over the status quo. And since he wound up in the White House, nobody should be surprised to see that many of his priorities are reflected in the House plan. So let’s grade the major provisions of this new proposal (with the caveat that grades may change as more details emerge). America’s high corporate tax rate is probably the most self-destructive feature of the current system. If the rate is permanently reduced from 35 percent to 20 percent, that will be a huge boost to competitiveness. Next to the lower corporate tax rate, this is the most encouraging part of the proposal. It generates revenue to use for pro-growth provisions while also eliminating a subsidy for bad policy on the part of state and local governments. Instead of allowing mortgage interest deduction on homes up to $1 million, the cap is reduced to $500,000. A modest but positive improvement that will reduce the distortion that creates a bias for residential real estate compared to business investment. Don’t die for six years, because that’s how long it will take before the death tax is repealed. But if we actually get to that point, this will represent a very positive change to the tax system. Here’s a useful summary from the Wall Street Journal of changes to business taxation. The bottom line is that half a loaf (or, in this case, a fourth of a loaf) is better than nothing. House Republicans have a good plan. Now the question is whether the Senate makes it better or worse (hint: don’t be optimistic).